In the decades leading up to the Civil War, slaves were not the only ones fighting for their rights and freedoms. Many abolitionists in the 1820’s and 1830’s extended their struggle to women’s suffrage. In fact, abolitionists and pro-suffrage advocates worked hand in hand, partnering with the Republican Party after it’s inception in the 1850’s. The women’s rights movement officially began in the summer of 1848 in Seneca Falls, New York, where Lucretia Mott and Elizabeth Cady Stanton organized the first women’s rights convention. Stanton was the wife of abolitionist Senator Henry Brewster Stanton, who joined the anti-slavery Republican Party at its formation. Both women were already extremely active in the fight for slaves' and women’s rights when they partnered up. In 1852, fellow Republican Susan B. Anthony joined the cause and worked with Stanton until their deaths. Many states and territories took up the cause on their own, with the first success coming in Wyoming. Republican President Ulysses S. Grant appointed Governor John A. Campbell and Attorney General Joseph A. Carey to the new Wyoming Territory in 1869. Shortly after arriving, Carey declared voters could not be denied their right in Wyoming based on race. Democrats in the area abhorred the idea of the black man voting and they planned to do something about it when they promptly won all 22 legislative seats in the territory. As a bonus, many were hoping to embarrass the Republican governor, thinking he would not sign such a bill. After weeks of discussion, the Wyoming legislature passed the bill, which, much to the Democrat’s dismay, Governor Campbell did sign. Whatever their motives, it backfired on them. The nearly 1,000 newly voting women leaned Republican, infuriating the Democrats. When a few Republicans were elected to the legislature in 1871, the Democrat majority immediately passed a bill to repeal the women’s suffrage law. Governor Campbell quickly vetoed the repeal, which fell short of an override by one vote in the Council. On the national stage, Republican Senator Aaron A. Sargent introduced yet another women’s suffrage bill to the U.S. Congress in January of 1878. Also known as the “Anthony Amendment”, this particular legislation would be defeated in Congress every year for the next forty years before becoming law in 1920. Both Stanton and Anthony would pass on, 1902 and 1906 respectively, before seeing the fruits of their labor. They had given the reins of their organization, the National American Woman Suffrage Association (NAWSA), to Carrie Chapman Catt in 1900, who successfully persuaded several states to include women’s suffrage in their constitutions. 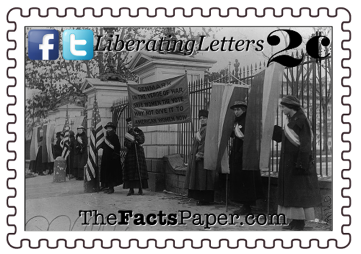 The NAWSA picketed the White House after the election of anti-suffrage Democrat President Woodrow Wilson. Over time, Catt was able to convince Wilson to change his strong stance against the cause, possibly because he was able to tie it to increasing women’s role in America’s involvement in World War I. In a speech to the U.S. Senate in September 1918, he stated, “I regard the extension of suffrage to women as vitally essential to the successful prosecution of the great war of humanity in which we are engaged.” A blatant racist as shown in Birth Of A Nation, some believe Wilson was motivated by the same reasons as the Wyoming Democrats in 1869, racism and increasing voter loyalty. His efforts failed, for the moment. Republican Representative James R. Mann, chairman of the Suffrage Committee, once again introduced the Susan Anthony Amendment on May 21, 1919. This time the measure easily passed the House. Two weeks later, the Senate narrowly passed the amendment, sending it to the states for ratification. In less than two weeks, six states ratified it. Thirty-five of the forty-eight states had approved the amendment by March 1920. Only one more state was needed to satisfy the two-thirds majority needed for full ratification. Seven of the southern states, dominated by Dixiecrats, segregation, Jim Crow Laws, and the KKK, had already rejected the women’s suffrage amendment, much as they did the abolition amendments. With Tennessee next in line to vote, many were not holding out hope. Tennessee’s legislature was in a 48-48 tie with one vote left. A young 23-year-old Republican, Representative Harry T. Burn, held the state’s position in his hands. As a good southern boy, he listened to his mother and voted for the amendment. U.S. Secretary of State Bainbridge Colby certified the 19th Amendment on August 26, 1920. Liberty, voting is a right but it is also an amazing responsibility. Now days too many people vote out of emotion, not logic, facts, or knowledge. They vote for who makes them feel good, or because of skin color or gender. Many people spent their lives to give you the right to vote. It is up to you to honor their sacrifice and hard work. You must take this responsibility with the utmost seriousness. You must do your own homework and not let anyone bully or shame you into voting for a person or proposal that they want. Make your own decision, keeping God and your principles as your guide.